We have had a cheap plastic bin in the past and replaced it when one of us fell over it. We had our kitchen done and decided to splash out. The bin is wonderful and just fits in the space, and the bags fit perfectly. No more falling over the bin lid and no more replacement. Expensive, but worth it. These bags are easy to use, they fit perfectly and they are really strong. I have every confidence that they will work well every time. I really like the clarity of size and the reminder to buy more. Thank you for your review! We're glad that you are enjoying your 50L Slim Open Can https://www.simplehuman.com/50-litre-slim-open-can-brushed-stainless-steel We hope that our products can continue to serve you well for the years ahead. Love these bags. They never fall into the pail. They always stay around the pail tightly. Strong, never have leakage. These are the best trash bags ever! Only wish they were less expensive. . . I know they would have to be more than the big brands since they are better quality, but they are pretty pricey. Great products. High quality bags that fit seamlessly to the waste can it goes with for a clean modern look. I highly recommend both products. These are the best garbage bags my family has ever used. They are durable and dependable. These bags are great quality bags. Do not rip easily. I think your product is excellent. I wouldn't buy any other liner. It fits well and the strength of the bag is excellent. I would give it a 5 star rating and would recommend your product to anyone. Best trash liners we have ever used period! We really like the bags, however the suggested N custom fit liners do not fit properly. My husband has to stretch the bag to fit. I don't have the strength to do that.. Your custom fit trash can liners are just awesome. I love the thickness of the liners and a perfect fit for my trash can and i have never had one of them to leak. I will continue to be a customer of Simple Human and all of your products are just simply great. The liners are great. I had paid for delivery however the liners were sent to me without enough postage being paid. I had to pay the post office a further charge before they would deliver. Thank you for your review Sue, a customer service agent has contacted you directly regarding your order. It's hard to make the trash look like a nice appliance in your Kitchen AND it matches your other Stainless appliances, but SH has done it. The liners don't slip and they don't hang over the top of the can. They are also sturdy! What a great duo between the can and liners! I really like the can liners. They fit my trash can perfectly. They are very strong and I have never had one tear. The order process is easy and simple, and ship next day. Great value. It's great to have a bag that you know is the right size, you just grab it and run always knowing you will have no problems. With that said I must say that I still think the price is a little high being I could put any free bags in the can. Résistant , reste bien en place, invisible! Theses fit great and work well, but they are expensive. A bulk pack should be available for commercial users. fast efficient shipping and liners fit perfectly. Thank you for your prompt delivery of my code N, custom fit can liners. I will certainly order the liners again. I love how these fit the containers so well - no more trying to make bags fit somehow. I also love the amount of trash they hold. They are a bit pricey, but the added capacity and the fit are worth it. These bags are well worth the money. Perfect fit, sturdy, and holds a ton! I ordered 3 packs of N bags and I received 3 packs of K bags. Didn't realize it till a couple days ago, but the K bags are to tight to fit correctly. We're so sorry to hear this. A customer service agent has reached out to you to correct this issue. These trash bags are super durable and hold a huge amount of trash! When you think the bag is full, you can pull it out and still add quite a bit more trash! I would recommend this trash can and liners to anyone who doesn't like an open trash can. These bags are the way to go form my SH trash can. These bags fit well, loved that I can have them delivered and they do the job. I love that Simplehuman bags fit perfectly in their containers. They are so strong and handle anything and everything placed in them. Definitely worth the price. I also love that their containers are guaranteed for life. Thank you for your feedback. We're very glad to hear that you're enjoying the liners. As a friendly reminder, the warranty period of our products depend on the model and retailer where they are purchased. Our cans come with either a 2, 5, or 10-year warranty. Please feel free to contact us at 877-988-7770 (M-F 8am-5pm PST) if you have questions about any of our products. They fit well, they do not leak and are easy to use. Like them a lot. Fits their can perfectly. Great quality. They hold a lot. I have never had a bag to tear. Price is good for the product. I love the fit of these bags in my simple human trash can and the weight is also great, they don't seem to tear easily. Love these bags. Have used them for several years and no others compare!!! They fit perfectly, and they are very strong. Very happy with the Code N can liners. Perfect size and sturdy. I was surprised to find that these trash bags are strong and that they hold a large quantity of trash. I have been using the "N" bags for a few months now and have not had any negative issues with them. These bags are great -- strong, easy to replace, very reliable. The bags are great - they are always full and never break. We liked them so much that we ordered the biggest pack of 400 which also saved us money. Great product. I love them. Good fit and very sturdy. These bags fit perfectly but I so wish You could offer a more environmentally friendly alternative. Thanks for your feedback Gwen. We’ll pass on your comments to our product development team. Brilliant product. Very strong, easy to fit and value for money. These bags are wonderful. The shipment was timely. This is a great product that is well worth the price. I won't go back, ever. After using the SimpleHuman N liners I can't ever go back to the grocery store kinds. Really, I also use these for wet food trash in a generic bin inside my lower custom kitchen cabinets because of their strength. And I use my SimpleHuman bin for all recyclables. The N liners in a 45 bag box saves me money, what a bonus. I love my slim simple human step can. It is so quiet and fits where I wanted it to. The liner is strong, never a tear or leak. I would definitely recommend this can and liner to anyone. Very durable, fits can perfectly, completely satisfied, thank you! I just reordered some more liners for my Simplehuman trash can and was pleasantly surprised that they now come in a more economical, convenient 45 pack. The price is excellent for the quantity and I've always been pleased with these liners (and with Simplehuman in general). Trash can liners fit the can they are designed for. They are strong enough to do the job. These bags are okay. Have had some that rip where the pull strings are attached so I had to put the bag in another bag which seems a bit wasteful. Thank you for your feedback. A customer service representative has contacted you to assist you. They are very good trash bags, but sometimes they do leak. I wish they would make the bottom a little big stronger, because that's where it leaks. It usually happens when I pull the bag out of the can and try to dump it in my trash bin. Over all the product is good, and I use it. Great product. They are thick enough to hold a lot, without splitting or tearing. i love this product. the trash liner is sturdy and fits our can perfectly. buying the 200 pack means we don't have to worry about buying new liners for almost 2 years!! sure the price of the trash can was a little steeper than your average plastic bin, but you get what you pay for, and the build quality is awesome. I haven't had any complaints in the 2 months I've owned the trash bin, nor have I had any complaints with the liner. Fit great, helps with sloppy kids and a DOG!!! Sturdy bags that don't disintegrate when full of rubbish! Made to fit the 40L waste bin and easy to use. After purchaseing the trash container, I was looking for the right liner,after visiting your website,I found it ,plus the codeing made it very easy to choose the right product. The bulk sale made it more affordable. I have used your product for almost two year's. would definately recomend. Hey, what can I say? They are bag liners. They are tough, haven't leaked and tie up with a drawstring. They fit the intended container well. Super fit . Super strong wii not break. Very strong good quality bin liners size N. They are very good size, last well and fit perfectly in the soft touch rectangular 45l bin. We have tried all different can liners and they all tear very easily. Forceflex- really! You might as well throw them away with the garbage. These bags are very well made. Highly recommend. The liner is strong enough and fits very well.I bought it in bulk so the price was very reasonable. Brilliant size, fits perfectly and looks good,no more daily trips to empty into outside bin. Very quiet closing, used all the time. Husband is skilled toolmaker and he is also impressed with the workmanship and quality. Delivered before 9.00 a.m.- added bonus. What can I say, they fit perfectly, they hold up nicely even with heavy loads and the help keep smells from escaping the can. I'll definitely be getting more once this pack runs out. These trashbags fit the can perfectly and are not that expensive if you purchase a large quantity. This bin is compact, the rIght size for a small- medium kitchen, excellent liners, easy to install and remove .A very good product. I WISH I could get these bags locally instead of across the country. Bed Bath and Beyond doesn't handle the N bags. Great bags with good secure ties. large capacity and very strong yet light construction. Looks, defintely! I had a plastic trash can that would probably had been condemned by the Health Dept. Now, I proudly display my Simplehuman for all to see. I am always cooking and having that foot control is oh, so convenient and clean. Why did I wait so long? Because I had an outdated kitchen with an outdated trash can. Updated my kitchen and my can! woo hoo! Excellent bin. I've just recently had a new kitchen fitted but there isn't much room for a bin. With this bin it is perfect for fitting into small spaces and is hidden. Fantastic. Just what I needed. 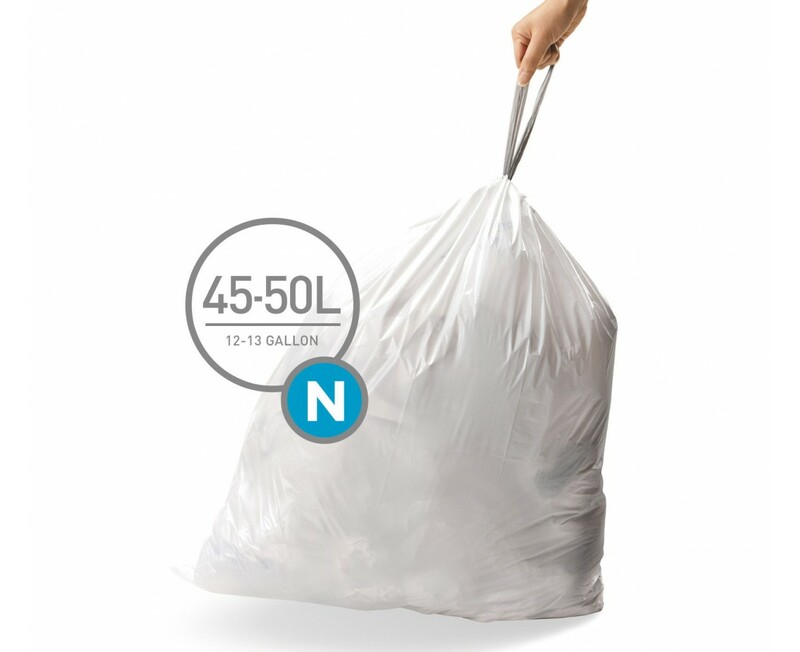 The Code N trash bag liners are the best trash bags I have found by any brand. They are the perfect size and are tough. I hate to waste money on other brands of trash bags. The Simplehuman trash bags may cost slightly more, but are worth every penny. This trash can is great Looks good and really uses every portion of the trash bags I will always use simplehuman!!! These bags look great and fits perfectly for my simple human can. we are very happy with this product. These bags are strong and very well made. Unlike normal bags they do not tear or split and represent excellent value for money. Really, I love the trash can that I purchased. It could have been annoying to have to buy special trash bags for it but so far things have been working out pretty well. My shipment came within a reasonable time. I ordered them in bulk. I've been using the bags for about a month and have had no problems with tears or anything. They are easy to open, durable, easy to take out of the can and tie. Contemplated spending the money. Finally broke done and didi it. It's so awesome and cute. The simple human trash bags r good to get too. I really appreciate the way these trash bags fit my simplehuman sensor trash can. No bag hanging over the side...nice, professional look for my office. I purchased the trash can for our kitchen based on it size. It fits perfectly and get used quite a lot. The liners make it easy to empty and do a great job of keeping it looking clean and attractive. the bags are very strong and hold a lot. i received the garbage can for xmas and it is great. These bags fit perfectly. We buy them by the box once a year and the price is comparable to buying bags in the store, but the fit is outstanding. The proper Simple Human ones are worth using. Best fit, thicker than supermarket options and only marginally more expensive. Look better and saves everything dropping onto your feet when you empty bin! A very practical and high quality product that has no flaws. We have used them for a number of years with pleasure. After reading some guys review of the trash receptacle stating he couldn't find bags that fit at his local shopping venue, thereby giving the receptacle a less than great review... my response is go back to the source. They're available from the manufacturer and thereby fit perfectly. Go figure. End of story. Very satisfied with the trash bags. They are sturdy and amply sized. As ever Simplehuman provided a quick efficient service and the quality of the liners, as with all their goods are excellent - top marks!! The liners are designed to fit the size and shape of the bin perfectly. Although the bin has a large storage capacity the liners are strong and durable and do not tear even when full or filled with heavy items. We bought two to fit in our new kitchen, easy on the eye, lots of space and the bin bags do not split and are easy to change....feels slightly odd raving about a bin and the liners but deservedly so, a good quality product. Quick and efficient service online and we would definitely recommend them. These bin liners fit the bin I have perfectly. They don't rip or tear like other cheaper versions. I can't fault them at all. Also, once sealed they don't leak any smells. They are strong, easy to fit in the cannister, easy to tie. A great no fuss product from a great company. The liner fits the can I purchased perfectly and is the only one that does. It doesn't allow the liner to slip down (from not fitting correctly) where the garbage gets in the can and the liner becomes useless. Well made bin bag and fits my bin perfectly. Never tears or gives even when you pull it by its handles. Wouldnt go back to other bags. These are excellent bin bags. Large and very durable. They hold a lot of stuff and never split. Ordering online was easy and the bags arrived within a couple of days. This trash liner is durable and holds quite a bit of rubbish. Even when you take the liner out of the trash bin there is additional room to add more rubbish. I really like this product and use it daily. It's size holds all the dishes that I have used. I use it mostly for pots and pans and it holds them all and I don't have to dry a couple to fit them all in. It looks really nice and is very sturdy. I have been very pleased with all the Simplehuman products that I have ordered. I would highly recommend it to family and friends. These bags are super sturdy--never rip or leak. They easily slide out of the trash can even when stuffed, and the handles are strong! Very good value!!!! A great liner and perfect fit for my soft touch trash can. These liners have handles that do not rip out of the bag. The bag also has a much larger capacity than you would expect. I love the new dispenser bag. It is now easier to remove an individual bag. Also a great price when purchased on the web site. perfect fit but where's the can? This review is for the bags but I have to say I am at a loss as to why the bullet style trash can which these bags fit was discontinued. I went to the store to purchase 2 more but they told me they were discontinued. Nor could I find them on the SH site. As for the bags, the sample bags that came w/ the can was style N, so when I went to purchase more bags it was a bit confusing that my style can wasn't listed as an option for that bag??? Anyways I think it's worth the extra $ to have a bag that fits a specific can so you don't have bags the continuously fall into the can. Very strong bags that fit my style can. great liners with a great fit to the trash container. Have been using these bags for years. Never have had one break or leak. They fit perfectly in the simple human waste can. I order once a year, they come in a tidy little package and take up little space. Because of these bags, the wastebasket never ever smells or gets messy. These liners are strong and most importantly, they fit the simplehuman trash can that I purchased. Excellent products all the way! Though available only from simplehuman, the can liners are worth the expense and effort. They fit snugly the inner plastic container, don't leak, and the ties don't tear through when the bag is fully loaded. I love how these replacement bags fit the trash can perfectly with no ugly overhang. It fits the trash can perfectly. We change bags about twice a week. The size is ample and the bag durable. Sometimes the ties are weak and break but the bag has never broken no matter how full it gets. These bags fit perfectly & they're strong enough to be stuffed without breaking! I have a Simplehuman Soft Touch trash can that uses code N liners. The Simplehuman liners are the best liners you can buy for your Simplehuman trash cans. The liners fit nicely and the quality of the plastic handles a full load of garbage. I think the 100 pack is the best buy. I saved a lot of money buying in bulk. The new 45l bags fit better than the old ones, too. These trash bags work very well, and they are made especially for my SimpleHuman slim trash can. No other bags fit as well--and these are substantial is plastic weight and holding capacity. I bought liners for our Simple Human trash can and they are a perfect fit. You can fill them full while they're still in the can, eliminating wasted space. They fit in easily, too. I find these trash bags to be very durable and of great capacity. The price of the bags is also reasonable. i am so glad i was able to find the exact bags for my simple human trash can. i had bout the can about 3 years ago and recently, my Bed Bath & Beyond stopped carrying the "N"code bags and i started using the "M"code bags. they were a little tight, but worked ok. i thought simple human had simply stopped making the original bags, but i was happy to find them on their site. the fit is much better. These are awesome bags. They fit perfectly, and although thay cost more they actually hold more, and actualy cost less because there is no waste. The trash can that I bought the liners for is still working great after 3.5 years. I love my simplehuman trash can, especially the plastic liner which is so easy to remove and empty. From the start I bought the bags made especially for that can, and while mail ordering trash bags might seem a little extreme, it is worth the effort. The bags fit the liner perfectly, with no bunching up or stretching at the lip, and are a good thick plastic not susceptible to rips and perforations. I order six months' worth at a time, store them in the pantry, and never run out of bags. Since my bags are packaged in a flat plastic pouch, I lay the opened pouch of bags in bottom of the plastic liner under the trash bag. Since it's flat, it doesn't take up much room. Then, on garbage pickup day, the new trash bag is right at hand. I tried other bags for my simple human trash can and none of them fit as well as these. Strong and easy to line the can. I "simply" place the container under the liner and always have one ready to go when needed. I purchased the case and I am glad I did! Simple human clearly continues to provide backup for their products long after retail outlets refuse to handle the supporting item. This marks a company that cares about MY satisfaction. These bags are very heavy duty. They fit the cans well & you can squish lots into them without them ripping. They are easy to tie closed, but, at the same time, can be easily re-opend if you forget to add something. I have used this trash can liner (bag) for several years. It is not available locally from Bed, Bath & Beyond any longer. I Purchased online from Simplehuman. The new liners from Simplehuman appear to be a thinner mil plastic and the price was higher than when purchased from Bed, Bath & Beyond. Why does Bed, Bath & Beyond not carry this particular liner any longer? This liner is an adequate liner and fits the trash can perefectly.